Custom Caribbean 2400. Originally built in late 2012 for offshore conditions in WA, this vessel was moved to Victoria in 2014 where it has since spent all of its time in Port Phillip Bay. Renowned sea going capability, absolute reliability and highly versatile. 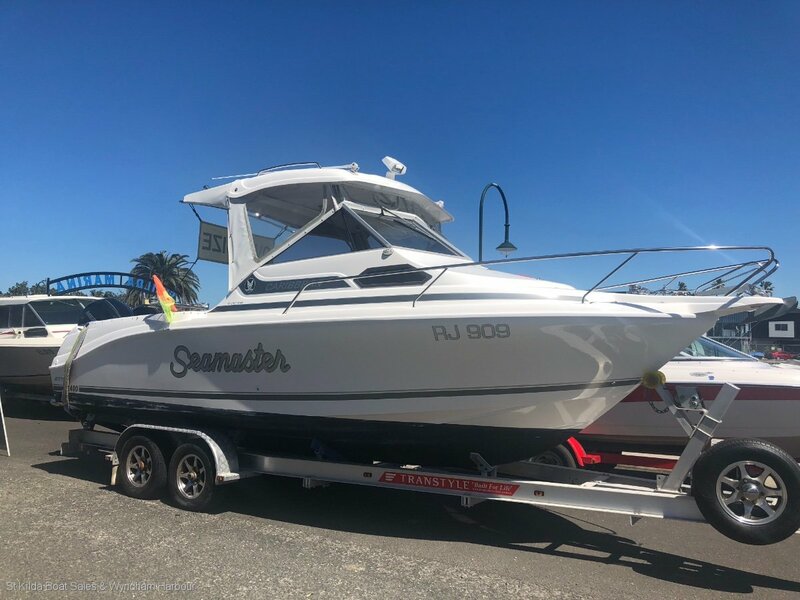 This vessel has been designed and customised for offshore and inshore fishing as well as family fun and entertaining and has been featured in Tradeaboat magazine and The West Australian newspaper. Customised bar work including a raised canopy for extra head room, full clears and storm covers. Fully fitted out for serious fishing and with a massive deck, there is enough room for 6 people to fish comfortably. When you want to take out the family or entertain, the deck easily converts to seating and a table for up to 8. To get there and back the custom built aluminium trailer makes towing and launching a breeze. Maintenance has been meticulous, with a full service history and the boat has been stored under cover, with the covers on. Spent over $4000 on rewiring, including 2 x new batteries and twin isolators. Ground Tackle: Anchor winch with 40m chain and plow anchor.